Hello! We had a birthday party to go to today, and I wanted to share the card I made : ) I used this adorable image from Stamping Bella called The Birthday Boy. The dp is My Mind's Eye Wild Asparagus and the sketch is from this week's Sketch Saturday. I decided to rough up the edges a bit with my Tim Holtz distressing tool, and also some Antique Linen Distress Ink. 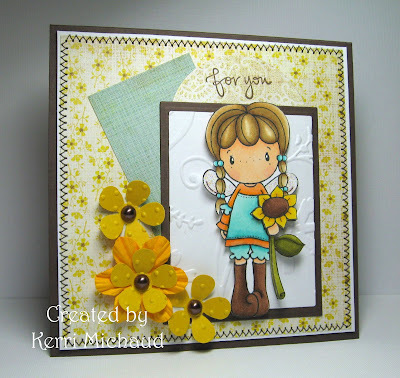 This is the card I made for last week's Sketch Saturday Challenge that I posted in my gallery on SCS, but didn't have a chance to post it here. I used C. C. Designs Swiss Pixie Birgitta and dp from Basic Grey Nook & Pantry. Thank you so much for stopping by! Kerri these are fabulous. We have a new challenge starting up in Feb we would love it if you would pick up a guest designer spot. scrap the art Your work is lovely. Both of these are adorable! I love the boy one, the color combo is perfect. The flowers & beautiful colored image on the second card is awesome. Love the layout on both. So cute! I'm going to be jealous of your stitching forever!!! Great colors on both of these, and once again, I love your fun embossed backgrounds behind the main image. ohh that little boy birthday card is so cute! Fun colors and fun little circles - just adorable. All your textures on the second card are a fantastic complement to the card. Perfect birthday card for a boy Kerri, I always have such a time with those, but you pulled it off gf! Great colors, and what a cute image! Aww, your second one is too sweet! Beautiful papers/colors, and way cool flowers...goes perfect with your image here...she's so cute! Girl...we have got to sometime try to get together so you can teach me how to color, LOL! Nice job, hon, great coloring, cute cards. Both cards are cute and wonderful! The images are great. These are both so darling Kerri! I had to come here and catch up and see what I missed over the weekend! Awesome take on the sketch. And your yellow creation is so sweet and cheery. You should submit this for the Saturday Spotlight. It is perfect for a "Sunshine" creation with bright bold colors or yellow. 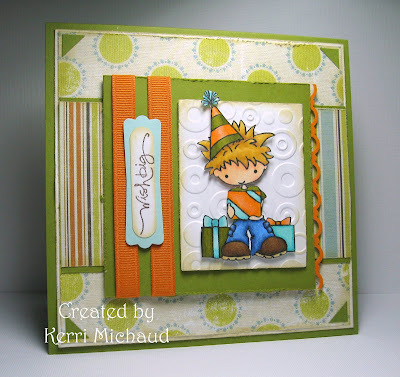 Adorable boy card! I love the distressing and all the layering! Really like the soft colors of the second! The flowers are so pretty, really like embossing! Listen girlfriend, these are both amazing. The boy one is so PHAT (that is boy talk hey) and the second is so pretty (for the girls)!